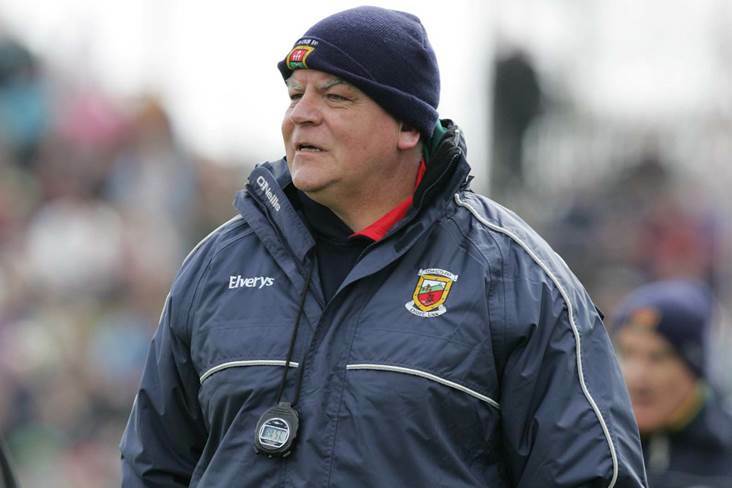 John Morrison as Mayo assistant manager in 2006. John Morrison will be remembered as much for his lateral thinking and quirky ideas as his coaching prowess. The Armagh man certainly knew how to think outside the box and as the GAA world comes to terms with his death today, many great stories are re-emerging, underlining his rather novel and entertaining approach to sports psychology. From throwing balloons at Paul McGrane for seven months to improve his fielding during his days in the Orchard County backroom team to bringing a skip to Derry training and telling the Oak Leaf players to deposit their negative thoughts in it or blasting out house music at Antrim training sessions, the larger-than-life Armagh Harps clubman was never short an idea or two to motivate his charges. In Donegal, John presented the players with nuts and told them to play like Brazil; he also sent Valentine’s cards to the Mayo footballers ‘from Sam with love’ telling them how much they were being missed. The greatest masterstroke of all was undoubtedly 'Hillgate' in 2006, when Mayo - with Morrison and Mickey Moran pulling the strings - knocked red-hot favourites Dublin out of their comfort zone prior to the All-Ireland semi-final at Croke Park, but inspirational coach John always had something fun and novel up his sleeve, which made him one of the GAA's greatest characters.